Combines 7 substances studied for their brain-protective effects against age-related damage. May promote regeneration of cognitive function. This new Neuro Nutrition formulation combines seven state-of-the-art nutrients, designed to protect the brain from age-related damage by supporting and regenerating cognitive function. It can be taken in a preventative capacity by healthy individuals and by those with very early stage degenerative problems. Also known as choline alfoscerate or alpha-GPC, alpha-glycerylphosphorylcholine is naturally present in the brain where it increases production of acetylcholine, an essential neurotransmitter necessary for healthy brain function but deficient in those suffering from Alzheimer’s disease. Alpha-GPC is therefore included in this formulation for its benefits in countering cognitive problems, particularly early stage senile dementia. It may also be classed as a nootropic - a substance enabling the body to adapt better to life’s challenges by facilitating motivation, decision-making, and in particular, improving cognitive and neurosensory processes as a whole. Also known as acid-5’-uridylic, this ribonucleotide (U) is one of the monomers that make up RNA, a thymine (T) analogue in DNA. It can form matches with adenosine (A) and can also be involved in the decoding of the genetic code by tRNA (transfer ribonucleic acid). Uridine stimulates axon growth, stabilises nerve cell membranes and increases acetylcholine production. It is used to prevent and treat neurological disorders, including Alzheimer’s disease. L-phenylalanine is an essential amino acid that cannot be produced by the body and must therefore be ingested from the diet. It is the precursor of L-tyrosine and subsequently of the neurotransmitters norepinephrine (the cerebral equivalent of adrenaline), epinephrine and dopamine. In its natural form, as a tyrosine precursor, L-phenylalanine stimulates cerebral energy, restoring or increasing neurotransmitter activity and promoting mental sharpness and alertness. It can also be converted, via other pathways, into phenylethylamine, a substance naturally present in the brain which helps produce a sense of emotional well-being. Thus increased levels of this precursor also have a positive effect on mood and behaviour. The sodium salt form of R-alpha-lipoic acid, sodium R-lipoate has much higher bioavailability than the latter. With greater stability and solubility in the aqueous phase, it is more easily absorbed and enables rapid achievement of plasma concentrations that are 10 to 30 times higher than those obtainable with pure R-alpha-lipoic acid. It is particularly beneficial in this formulation because, like alpha-GPC, it increases acetylcholine production. It therefore prevents cerebral ageing, improves memory, reverses cognitive dysfunction and protects against age-related neuro-degeneration. Famously combined in Dr Ames’ study, the action of N-acetyl-L-carnitine with R-alpha-lipoic acid provides long-term protection to mitochondrial health and promotes optimal cell metabolism. This acetylated derivative of the amino acid L-carnitine increases acetylcholine production, prevents the effects of ageing on the brain and protects neurons from oxidative damage. • has powerful protective effects on nerve tissue and the central nervous system. In addition, it helps support emotional well-being and social behaviour in elderly people. This amino acid is abundant in the brain, blood and cerebrospinal fluid. It protects brain cells, thus improving cognitive and learning function, while at the same time stimulating memory and concentration. It plays an important role in the circulation of amino acids in the brain and confers protection largely by regulating the transport of glutamate and eliminating excess amounts from the brain. Gastrodia elata blume, part of the orchidaceae family, is a plant used in traditional Chinese medicine (Tianma) to reduce migraine, convulsions, hypertension and neurodegenerative diseases. According to recent studies on mice, this extract - standardised to 98% gastrodin - may encourage certain neuro-regenerative processes by mobilising neuro-protective genes and improving synaptic neuroplasticity. 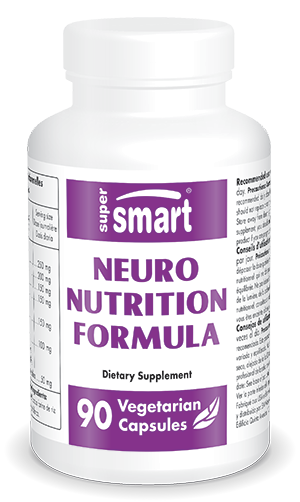 This new Neuro Nutrition Formula with its specially selected, synergistic ingredients represents an exceptionally valuable protective aid against cognitive problems and other brain imbalances that can affect adults and older people. Adults. Take 1-3 vegetarian capsules a day with meals.